We’d love your help. 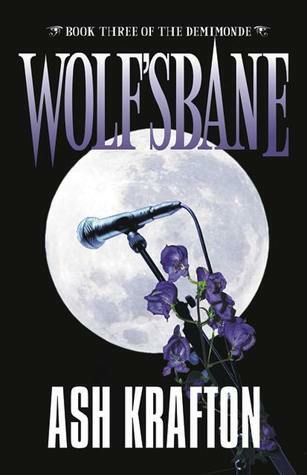 Let us know what’s wrong with this preview of Wolf's Bane by Ash Krafton. Sophie’s quest to save Marek is further complica Since becoming oracle to the demivampire two years ago, advice columnist Sophie has battled werewolves and survived a vampire attack (or two). However, not only was she powerless to save her lover Marek when he slipped to the brink of evolution, she also witnessed his transformation into a falcon, the symbol of Horus United. To ask other readers questions about Wolf's Bane, please sign up. Sophie, an advice columnist, and an oracle to the demivampires, is still longing for her lost love, Marek. As he began to evolve f I really enjoyed the first two books in the series, and was eager to jump back into Sophie's world, where vampire's and werewolves abound. We do get back into the business of the demivampires in this third installment, but the book veers into entirely new territory... where rockstars and werewolves collide. As for Sophie, that's where things become stranger than ever. She is surrounded by secrets and deception, and figuring out who to trust is only half the battle. She's trapped between worlds, and still sorting out who her true friends are, all while enduring changes happening from her werewolf bite. It's a lot to take in, especially since just a few years ago she was unaware of the supernatural elements all around her. But she's not ready to give up on her true love, Marek. The problem is, she might not have a choice. I absolutely love this series and actually put off reading this one because I feared the let-down of finally having it all end. Each of the previous books left things in a dire, interesting place so that I was eager to know how things can possibly be fixed. The world of the Demimonde is so incredibly creative, fascinating and complex and to all that this book added the expansion of the were and witch cultures. Now while, I found it interesting to spend time with the weres and the witch encounter I absolutely love this series and actually put off reading this one because I feared the let-down of finally having it all end. Each of the previous books left things in a dire, interesting place so that I was eager to know how things can possibly be fixed. The world of the Demimonde is so incredibly creative, fascinating and complex and to all that this book added the expansion of the were and witch cultures. Now while, I found it interesting to spend time with the weres and the witch encounters, I confess that the biggest draw always are the DVs, vamps and of course The Sophia (and I'm not referring to myself in the third person since this is a position of power that just so happens to have a fabulous name) interacting and in Sophie's case mourning Marek's change and seeking a solution. The story opens to Sophie attempting to recover from her second loss of Marek when his encounter with a werewolf forced his change into the legendary Wolfram falcon. Researchers have been working hard on restoring DV who made it this far in the process, but so far no success. On top of the loss of Marek, Sophie is forced to put up with Rodrian's coddling and the complexness of their relationship as friends. She just wants a night off from it all so she goes with a demivamp friend to a rock concert hosted by the weres and ends up upsetting the werewolf applecart when their King thinks she is his soulmate and triggers the courtship/mating process without a by your leave. Sophie is conflicted about this new change. Does she embrace this thing with Dierk and accept that Marek is gone? Does she have a choice after getting bit and must wait until the next full moon to see if it takes? But of course, toss in the unexplained attack on her, a jealous were female, a sneaky office intern, loneliness because Aurelia is jerking around Rode and the girls so that Sophie never sees them, and the fact that her heart is still broken for Marek and she grieves that he is there- the falcon remains close- and yet he is gone. Life is never dull for trouble magnet Sophie. I'm a tad torn about this last book. I both enjoyed it and yet wanted for something very different. I was engaged from the start and enjoyed the entire story though some parts were more enjoyable than others. I was taken by surprise when the story went off in a whole new direction. Unfortunately, that direction felt like something that I had to patiently endure before things got back on point. I so wanted more Marek and Sophie and I wanted to know how Sophie would help restore Marek that it was hard to appreciate the rest. The argument of fate and tradition against personal desire and love was a good one and I loved seeing that play out. The mean girls thing that Sophie had to endure from a were with a crush on Dierk and Rode's mate Aurelia was entertaining and I really wanted to smack around the both of those irritating gals. I liked the little mystery of who was trying to kill Sophie. But ultimately, I just wanted her to have her Marek and for me to get some good strong Marek scenes. It's a back-handed compliment to the author that I was torn about this one. If she hadn't written such a fantastic hero in Marek and such moving intense scenes for Sophie and Marek in the first two books, I wouldn't be so impatient with the otherwise engaging story in this one. Haha! Still, for all my impatience, I can whole-heartedly recommend this series to Urban Fantasy fans who love their vampires and want something a bit different in that culture. I had very mixed emotions about reading Book 3 in the Demimonde series. I was very excited to see the release of Wolf's Bane and couldn't wait to get my hands on it - after all, I love me some Sophie, Rode, and Marek. Unfortunately, with the release of this novel comes the end of the series. I'm very happy, however, with the way Wolf's Bane was finalized and the Demimonde series was wrapped up. I'll keep my detailed summary to myself so as not to spoil anything. This series gave vampires a differ I had very mixed emotions about reading Book 3 in the Demimonde series. I was very excited to see the release of Wolf's Bane and couldn't wait to get my hands on it - after all, I love me some Sophie, Rode, and Marek. Unfortunately, with the release of this novel comes the end of the series. I'm very happy, however, with the way Wolf's Bane was finalized and the Demimonde series was wrapped up. I'll keep my detailed summary to myself so as not to spoil anything. This series gave vampires a different and unique spin. They aren't your everyday, run-of-the-mill bloodsuckers. There are also other paranormal elements such as werewolves, oracles (called Sophia, which is what Sophie is), and witches. There are elements of discontentment between factions and from within factions, too. This feature gives fictional characters real life qualities - easy to relate to and identify with. Sophie is a very strong character, even when she's distracted by a wily werewolf who claims that 1) he's the king, and 2) that she's his mate (cuz the moon said so). She's very emotionally wrecked in Wolf's Bane, and quite close to giving up, but she pulls through and deals. Rode and Sophie have a unique relationship that's hard to define yet easy to visualize. They need each other as they both lost a piece of themselves with the transformation of Marek. The emotions that Ash Krafton invokes in her readers is phenomenal. I found it nearly impossible not to feel like I was inside the novel. Each expression of emotion, from elation, to despair and anguish, and anger just flourished as I became one with the book. Wolf's Bane is so well written that you have a really hard time putting it down. The dialogue is fluid, the plot is solid and Ash certainly keeps the reader guessing. I found that I became more and more impatient to learn the outcome the further I read. I so wanted to just skip ahead, read the ending, and then backtrack to where I left off -- I'll have you know that I did NOT end up doing that. I sucked it up and read it the right way. Thank you, Ash, for bringing us Sophie, Marek, Rode and the rest of the cast. They will not be soon forgotten. The will forever have a place on my reading list. Disclaimer: I received an ARC of this book from the author, Ash Krafton, in exchange for an honest review. Wolf’s Bane is the third and final book in the Demimonde series, a series I was introduced when I won Bleeding Hearts and became not only a fan of the books but also of Ash Krafton. Sophie’s heart is still broken after what happened to Marek in the second book. We can feel how miserable she is and how desperate she is to find her happy ending. She’s trying frantically to bring Marek back and to be with him while fighting her shattered heart and her role as the Demivampires’ Oracle. Wrap all that with Rodrian’s change in behaviour and her now sudden thrust into the Werewolves’ world. Sure, she’s always been deep within this supernatural bubble but never so deep into Werewolves’ topic… actually, she tried to avoid it as much as she could. But after a concert and meeting Dierk, the Were King, she finds herself as the Were King’s mate. Let me first start by saying that as soon as I met Dierk and he and Sophie had that electric jolt between them, I was extremely scared of what was going to happen. And, I also have to admit, that at first I didn’t like Dierk’s attitude towards Sophie. I felt that he was too possessive and little interested in her own opinion. However, while I continue reading the development of their relationship, I realised that his character was just troubled and also wishing to have his own happy ending. Though I was rooting for someone else – and I’ll mention that somewhere later on this review – I couldn’t help but hoping that Dierk would find someone else. Most of the book was centred on Sophie and Dierk. How their abrupt turn of events became something deeper. It wasn’t a love story like Marek and Sophie had in the first book but it was lovely to read Dierk’s devotion not only towards Sophie but also towards his own kind. As the Were King we got the chance to be deep inside the werewolves circle and meet this new side of the supernatural. Sophie had to wait for the full moon to know if she was, indeed, destined to be with Dierk. And, let me tell you that the waiting almost killed me. When the fateful night of the full moon came, I was literally scared of what was going to happened. I didn’t know what Ash Krafton had reserved to us and for a moment I feared! But of course that Ash would never let us suffer much – even if we had spent the whole book suffering because of Sophie. Sophie broke my heart during this book. I felt that she was so tired, so weak and ready to give everything up. And for a moment she was ready to do so. And that made me sad because she was so strong on the previous books and I felt her light fade. Especially because she was seeing her whole life disappear before her eyes and her identity being torn between being faithful to her Demivampires – which meant fighting to save Marek – or give herself in to Dierk and the werewolves. Now, on my review of Blood Rush I mentioned something about changing Teams. On Bleeding Hearts I was Team Marek and then, on book two, I found myself being Team Rodrian. And, you want to know something funny, I found out in this book that I am, indeed, Team Rodrian. I’m totally shipping Sophie and Rodrian!!! Even though I’m extremely and beyond happy with the end of the book because of Sophie, I want more Rodrian… I want him to be happy as well! Overall Wolf’s Bane was an emotional ride, the sort of book that makes you feel so many things from sadness to frustration to delight. You end this book with such a strong connection to all characters you find yourself sad to leave them. Ash Krafton created another great book, an amazing conclusion to her supernatural series and such remarkable characters that I will never forget. As the 3rd and final book in Demimonde series you would hope for the author to finally provide a happy ending for Sophie, that wish is granted but on the way to it is one obstacle after another that will come as no surprise to readers of book 1 Bleeding Hearts and book 2 Blood Rush . In Wolfsbane we find Sophie Galen finally embracing the power she wields as the Sophia, we also find her still pining for her lost love Marek with a hole in her heart that nothing seems able to fill. Trying to relax and relieve some of the stress she has been under Sophie consents to attending a show with Dally by one of her longtime favorite rock performers Dierk Adeluf, this proves to be very much to her liking as she actually gets to meet Dierk and even go backstage where they talk about everything and nothing. The connection that Dierk and Sophie form is not one to take lightly, according to his beliefs she is his fated mate and in accordance with Werekinder history if she turns into were on the full moon after being bitten than as King of the Were’s she will become his Queen. While I will admit that Dierk was great he was not as good a fit for Sophie as Marek, she knows deep in her heart that her love was given to one man and no matter how much she wishes otherwise there will never be another who can make her feel the same. Focusing on the relationship that Dierk slowly builds with Sophie, her conflicted feelings about him and her duties to the DV’s, the story brings the reader into new territory while also resolving past issues by the end of the book. There is a very nice twist or two that author Ash Krafton throws into the mix that manages to clear up the confusion and brings a resolution that finally gives Sophie a chance to make her long awaited fondest wish come true. Without a doubt this was my favorite of the trilogy, it ended on a positive note which made me happy. So let me tell you how much I LOVE this book, and this series! I've been hooked since the beginning, and I can't help but love everything about it. And this book was soo good, that I was sneaking it into work and other places where e-readers were banned... I couldn't help it! A book this good is worth the consequences of getting caught! Which I did... Several times... And it was SO worth it! BEST HAPPY ENDING EVER! That is what this book has. I didn't see it coming, and it had me jumping up and down, wanting to text friends about how happy I was with just happened in the book (at which point some of my friends kindly tried to remind me that it was just a book. I'm going to have to teach them that they aren't just books :-) ). The prologue just broke my heart for Sophie. I think she is seeking help for an impossible situation in the wrong place. Instead of accepting and mourning the loss of Marek, she is in denial... Which is one of the worst stages of grief in my opinion. But even with all the denial and grief, I still have hope. Because the Sophia is hope. Period. But on the subject of grief, this book covers the gamut, and I approve. Ms. Krafton hits the nail on the head about grief, and as the reader I can very much relate to Sophie's grief in the loss of Marek. I think the grief is worse for her because the lost the person in only a part. I relate this best in how I've lost my dad that I knew to a stroke. He is still alive, but he isn't the man I knew and loved before the stroke... He is missing. And that is what it is like for Sophie. Marek is still alive, but is a gyrfalcon... And for her the grief is even worse because of the looking for a cure, the hope of a cure. What is up with Rodrian? I mean, does he have a crush on Sophie? Is he hoping to be the man in Sophie's heart, in place of Marek? I kind of felt sad for him, and didn't know whether to cheer him on, or want to boo him out of the book. Okay, the idea of the Leni sounds kind of cool. Except I didn't like not getting all the information up front. I felt that the Weres were sort of treating Sophie like she was some idiot, not giving her all the information upfront and honest like. Yay! Finally, we get to look at the Were culture through a Were... Everything we've gotten in the other books has been colored by DV prejudices. Now that we have a clean slate and have gotten to learn about them, I'd like to see more Were stories! Oh, the frustration! To think the whole time about becoming a Were, and then suddenly there is a BIG twist that happens, and it is NOT what you were expecting, and WOW! Again, loved that I was still able to be surprised. I loved getting to see Shiloh, Dahlia, Toby, and Fraidy. Characters that I have loved from the other books, it was great to see how they have progressed, grown, and are still characters that I love. Overally, this is a great book, an awesome series, and if you haven't read it yet, you must! I highly recommend it! I received this book in exchange for an honest review. The ideas and statements in this review are my own. 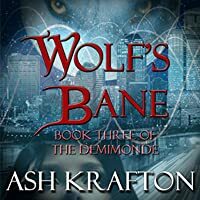 Wolf's Bane by Ash Krafton is an Urban Fantasy set in a contemporary environment with the exception of Werewolfs, Demivampires, Vampires and Witches. Wolf's Bane is the third book in the Demimonde series which I didn't know going into this read but becomes rather pertinent in my review. The heroine of the story, Sophie Galen, is an oracle for demivampires, usually referred to as demivamps in I received this book in exchange for an honest review. The ideas and statements in this review are my own. The heroine of the story, Sophie Galen, is an oracle for demivampires, usually referred to as demivamps in the text, but that is where all of the confusion stems. Sophie has this mysterious, to me, and miraculous power to enter the very essence of a demivamp/vampire and draw out the negative emotions that plague his soul. It made for a rather confusing start to the story. Ash Krafton committed one of the great literary sins in my opinion—she assumes the reader has consumed her previous books. Going into the first chapter, I had not a clue as to what the author was trying to lay out. I definitely sensed I was missing something. Sophie referred to her power as the Sophia. For a while, I thought it could be a split personality and then I thought it was her alter ego but no, she writes her advice column as Dear Sophie. So in the end I found it to be a bazaar writing choice to use "the Sophia" in reference to her power but that was not the end of my confusion. Once again within the first chapter, the reader is presented with the concept of demivampires vs. vampires with no explanation. You soon understand that vampires are horrible sun sensitive moralless killing machines, but demivamps are left with little explanation. You understand that demivamps are better than vampires but in the end I west left with unanswered questions. There is a brief mention of Marek her previous lover who is a bird, for reasons you do not know, and you have little care for why by the time rockstar Dierk Adeluf shows up. Yeah, he's a rockstar she totally fangirls on, and he also happens to be the king of the werewolves. Unknowing of the love she has for Marek you totally believe that Dierk is her destined love. The very moon is drawing them together, right? On the other hand, I personally had a bipolar view of his character, liking him one line and not the next. His set up was a little too conveniently good, typical of paranormal romance, but his personality rubbed me the wrong way too often. I know this seems like I don't like the book, but on the contrary I think it is on the whole quite well written. Ms. Krafton has a very descriptive style, and the book is well edited. I don't care for the dialog at moments, but once again overall it is well done. She takes you on a wild adventure as Sophie is inundated with misfortune. > Wolf's Bane is the third book in the Demimonde serIes and ends with an HEA. I have to admit that I did not read books one and two in this series. I did not have any problem getting caught up with, and getting caught up in this story. Sophie is a human with a magical force inside her. This force takes away all bad feelings from non evil (Demi) vampires. We meet members of her demi vampire inner circle, es I received this book from the author and from Paranormal Romance and Authors That Rock. > Wolf's Bane is the third book in the Demimonde serIes and ends with an HEA. I have to admit that I did not read books one and two in this series. I did not have any problem getting caught up with, and getting caught up in this story. Sophie is a human with a magical force inside her. This force takes away all bad feelings from non evil (Demi) vampires. We meet members of her demi vampire inner circle, especially Rodrian. Apparently, Sophia was in love with Rodrian's brother, Marek. Marek had something happen to him and he was no longer around. He wasn't dead, but unable to be with Sophie. It takes awhile to learn he is now a falcon that flies around by Sophie. Sophie was so in love with Marek and it had to have been reciprocated as Marek left Sophie everything in his will. At a concert, Sophie meets her favorite lead singer and feels a connection. Now we are introduced to all things Werewolf. Sophie is claimed by the Were king. She is upset at first, but the king is kind and seems to really care for her. She informs him her heart will always belong to Marek, but he believes she is his Destiny and this cannot stop his intentions. The Demi vampires and Werewolfs do not get along. Sophie has to choose one or the other. Sophie is in danger often from both sides trying to stop her. Rodrian acts as if he is in love with Sophie and this choice is killing him. The weird thing is that Rodrian has a mate. I didn't get the love there. It was way more than brotherly. Will Sophie get her happy ending? Can she love anyone besides Marek? This book keeps you guessing. The feeling of love is thrown around quite a bit. The feelings seem to turn on and off a lot, especially with the Were king and Rodrian. This cheapened the true love that finally wins out at the end of the book. > This book does end with an HEA, but the story could definitely continue. I enjoyed the characters, the danger and the unknowns that Sophie had to face. I could relate to Sophie's feelings of loss and acceptance. I would love to read more of these characters. I received a copy to review from the author. I had been waiting what seemed like an eternity (but not really) for this book. I loved the first two books and felt at home with the characters. After the ending of the second book, I had to know what happened next. Sophie Galen is trying to move on and be happy while at the same time she is determined to find a way to bring back Marek. She goes to a concert with her friends and is bitten by a werewolf and told she is meant to be mated to the Were Kin I received a copy to review from the author. Sophie Galen is trying to move on and be happy while at the same time she is determined to find a way to bring back Marek. She goes to a concert with her friends and is bitten by a werewolf and told she is meant to be mated to the Were King. Sophie is shocked and beyond upset about this at first. She tries and tries to tell the Were King, Dierk, that she is not meant to be his but Dierk has his mind set that the moon chose her and that it is destiny. Dierk then courts her the most that she will allow. During the courting, Sophie tries to prepare herself for when she is supposed to turn into a werewolf, continues to search for a way to bring back Marek, and tries to save Rodrian from being crushed by his mate. I was a bit irked at first by Dierk being a new love interest for Sophie because I felt that she was meant to be with Marek. As the story went on and we got to learn more about Dierk, I found myself liking him more and more. I was anxious to see how this story would end though...mostly because I was torn between which ending I wanted for Sophie. I felt bad for Sophie on so many levels. Her life just seemed like nothing would ever be simple for her. She is torn romantically, has to deal with snobby interns and infuriating mates/wanna-be-mates, numerous attacks/threats on her life, and her future seeming to change every other day by some new dilemma. In the end, I was beyond happy with the ending for Sophie. It felt so right for her and it was nice to see her finally at peace with everything and happy. This is the third book in the series, but it can be read as a stand alone. Of course, it always helps if you’ve read the others but you won’t have any issue staying caught up with what’s going on. Sophie Galen is trying to get on with her life, but she’s also trying to find a way to bring Marek, her one true love, back. He was turned into a falcon and follows Sophie just about everywhere. It seems that nothing in her life would ever be simple. She’s lost the only person she feels she could ever l This is the third book in the series, but it can be read as a stand alone. Of course, it always helps if you’ve read the others but you won’t have any issue staying caught up with what’s going on. Sophie Galen is trying to get on with her life, but she’s also trying to find a way to bring Marek, her one true love, back. He was turned into a falcon and follows Sophie just about everywhere. It seems that nothing in her life would ever be simple. She’s lost the only person she feels she could ever love and then…. she’s bitten by a Werewolf and the Were King informs her that he believes she is his soul mate. At first I didn’t like Dierk (the King) and I didn’t like him for Sophie. I guess maybe I was somehow hoping that Marek would return and everything would be as it should be (in my mind anyway). But as the story went on I really started to like Dierk. Of course, the Demivampires and the Werewolves do not get along, so Sophie is at odds all the time about having to choose a side, since she is the demivamp Oracle after all! The one thing that I didn’t like was the plot between Sophie and Rodrian (who happens to be Marek’s brother). He acts like a completely lovesick puppy around her, yet he has a mate. His affections towards her were a little more than “brotherly”. It seemed that every day was a new dilemma for Sophie and I really wanted her to get her HEA. And the ending was perfect. It wasn’t exactly as I imagined it would be, but everything felt right with the way things ended…she was happy and because of the way things were left there is definitely a possibility for more for these characters down the road, but I won’t hold my breath. This book will elicit a full range of emotions. And even though this can be read as a standalone, I would recommend picking up the first two books so that everything makes sense. If you are a lover of vampires, werewolves and romance you will enjoy this book. I think I can honestly say this is my favorite book so far in this series. While I have enjoyed reading about Marek and Sofie and then later Rode, I really liked the addition of Dierk. I believe this is the end of the series and if it is I am sad to see it end but can we get some more Dierk?!!! This book was a little different than the first two in that it did not center around Marek and Sofie. This was more centered around Sofie and her life with all the different people in it. I have to say tha I think I can honestly say this is my favorite book so far in this series. While I have enjoyed reading about Marek and Sofie and then later Rode, I really liked the addition of Dierk. I believe this is the end of the series and if it is I am sad to see it end but can we get some more Dierk?!!! This book was a little different than the first two in that it did not center around Marek and Sofie. This was more centered around Sofie and her life with all the different people in it. I have to say that I was not expecting everything with Dierk to happen but it was a very pleasant surprise and I was a little disappointed when things didn't go as I would have liked. However that is because the book took a twist that I was not expecting and still turned out good in the end. As before the characters still jump off the pages at you and I can really visualize what is happening through out the book. I will be re-reading this series all together again at a later date because I did enjoy it. The author has a way of sucking you into the pages and not letting you put down the book until the end. The only thing I would change is that I felt that while Marek's situation is resolved by the end of the story I felt that Rode's still was not and I would like to see his story. Also with the introduction of Dierk I really liked that character and what he was trying to do with the were groups. I hope to see both of these characters in future books from this author whether it is another series or a continuation of this series. While there was a couple things I would change it still didn't detract from the book because it was still beautifully written and I thoroughly enjoyed it. I will definitely continue to read books from this author in the future. I so much enjoyed this book more that the 2nd book ‘Blood Rush’. I felt that there was more to get your teeth into. The mystery, suspense, jealousy and the numerous attempts on Sophie’s life are just the start. And then there is the added factor that a Rock Star Wolf thinks that Sophie could be his life soul mate and destiny may have other plans for Sophie’s life, then add in Witches, a mystical presence to the mix of Demi Vamps, Were’s, jealous ex’s, mates, work life, interns and research and t I so much enjoyed this book more that the 2nd book ‘Blood Rush’. I felt that there was more to get your teeth into. The mystery, suspense, jealousy and the numerous attempts on Sophie’s life are just the start. And then there is the added factor that a Rock Star Wolf thinks that Sophie could be his life soul mate and destiny may have other plans for Sophie’s life, then add in Witches, a mystical presence to the mix of Demi Vamps, Were’s, jealous ex’s, mates, work life, interns and research and that is the story of Sophie’s Life. I so much enjoyed this book more that the 2nd book ‘Blood Rush’. I felt that there was more to get your teeth into. The mystery, suspense, jealousy and the numerous attempts on Sophie’s life are just the start. And then there is the added factor that a Rock Star Wolf thinks that Sophie could be his life soul mate and destiny may have other plans for Sophie’s life, then add in Witches, a mystical presence to the mix of Demi Vamps, Were’s, jealous ex’s, mates, work life, interns and research and that is the story of Sophie’s Life. I thoroughly enjoyed the book, however the book isn’t without its gremlins (figuratively speaking) there are still some unanswered questions, which I hope will be revealed in another book…. (hint hint)! There were still some grammatical errors in the book, though not to the point of distracting you from the story line. I had to refer back to pointers in the book to familiarise myself with the legend’s when something apparent happened and when the story flipped from one drama to another and then your sort of wonder what happened to that person or the situation, though apart from this, the storyline was great and once I got stuck into it, I could not put the book down. Ash Krafton is a USA Today and international best-selling speculative fiction author from the coal region of Pennsylvania. She's the author of urban fantasy and paranormal fantasy novels, as well as poetry, short fiction, and non-fiction articles on the craft writing and publishing. Her first novel series, The Books of the Demimonde (BLEEDING HEARTS, BLOOD RUSH, WOLF'S BANE), earned several awards Ash Krafton is a USA Today and international best-selling speculative fiction author from the coal region of Pennsylvania. She's the author of urban fantasy and paranormal fantasy novels, as well as poetry, short fiction, and non-fiction articles on the craft writing and publishing. Her first novel series, The Books of the Demimonde (BLEEDING HEARTS, BLOOD RUSH, WOLF'S BANE), earned several awards and distinctions, including Finalist ranking in several RWA chapter competitions. A paranormal romance WORDS THAT BIND also received distinctions and is published by The Wild Rose Press. She has also written New Adult speculative fiction as AJ Krafton. Her début, THE HEARTBEAT THIEF was released in June 2015 and has made the Amazon bestseller lists for historical, fantasy, and coming of age fiction. Currently, Ash is working on a new urban fantasy series, THE DEMON WHISPERER. The first two books, CHARM CITY and MURDER THE LIGHT are available now, with the series prequel STRAITJACKETS AND HOLY WATER coming out in late 2018 when it will be featured as part as a multi-author boxed set. She is also releasing a stand-alone urban fantasy TAKIN' IT BACK in August 2018, a book that will put a fresh twist on the old swish-and-flick. Audiobook lovers can find the Demimonde series on Audible as both individual books as well as a series bundle. Several other titles are currently under production and will be released over the rest of 2018.